Silymarin, the main bioflavonoid complex found in milk thistle seeds, has been used to support gallbladder and liver function and to promote healthy detoxification function. Silymarin is a flavonoid compound derived from milk thistle that supports liver function and enhances detoxification pathways. It is also used to support the gallbladder, kidneys, and spleen. Silymarin prevents the depletion of the intracellular antioxidant, glutathione, within liver cells, thereby enhancing detoxification and protecting cells from free radical activity. 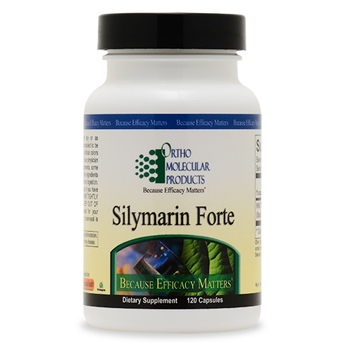 Due to its variety of functions, the Silymarin Forte formula makes a potent addition to any liver support and detoxification program. Silymarin has a well-established safety profile and a long history of medicinal use. The Silymarin Forte formula includes 200 mg milk thistle per capsule, standardized to 80% silymarin.